Coming Up! Volume 3 Issue 1 for 2011. Subscribe and book your copy AND How about contributing to this issue. Looking for unique, unpublished, more arty/documentary aviation imagery and articles. Editors are girding their loins to tackle a grand project – the LCV Year Book 2010. 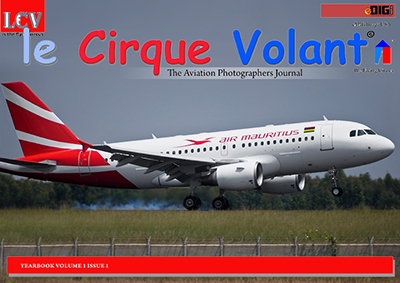 2) Aviation related stories and articles, with images. 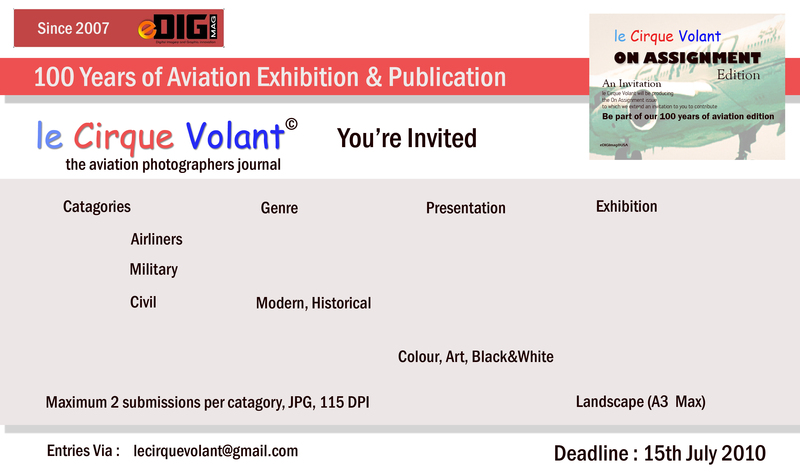 3) “Best of” aircraft images and aviation related artwork. Deadline : end of June 2010. Leave a comment if you would like your contribution to be considered. A gawp at the ‘blank’ cover – imagine your aircraft image here. And a sample cover image from @RatManDude. 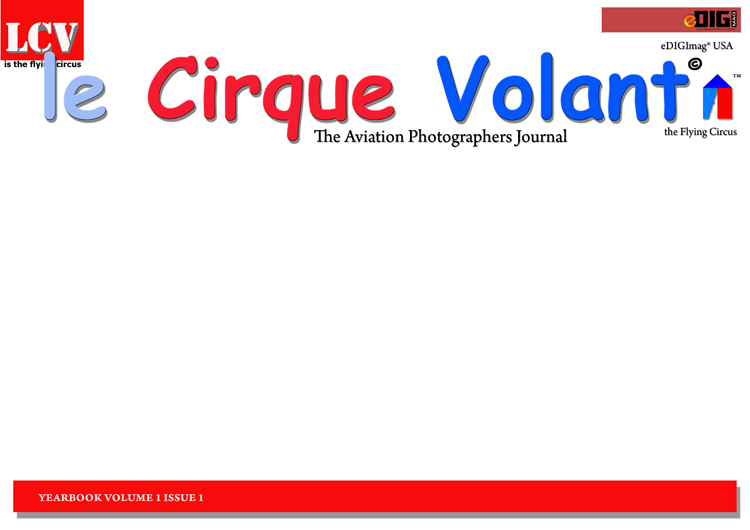 The All New le Cirque Volant will be published as a multi-media production every 4 months. A huge collection of images in the emag is now possible. Available only on DVD! Subscription for this publication requires your postal address *We Ship* and USD $ 30.00 for 3 Issues annually. The Access Code for this Publication is “etrex”. 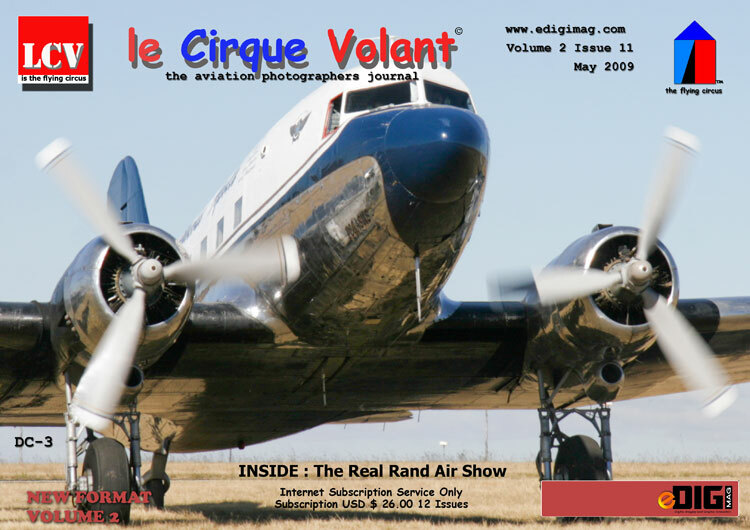 Volume 2 Issue 12 – June 2009 Issue. 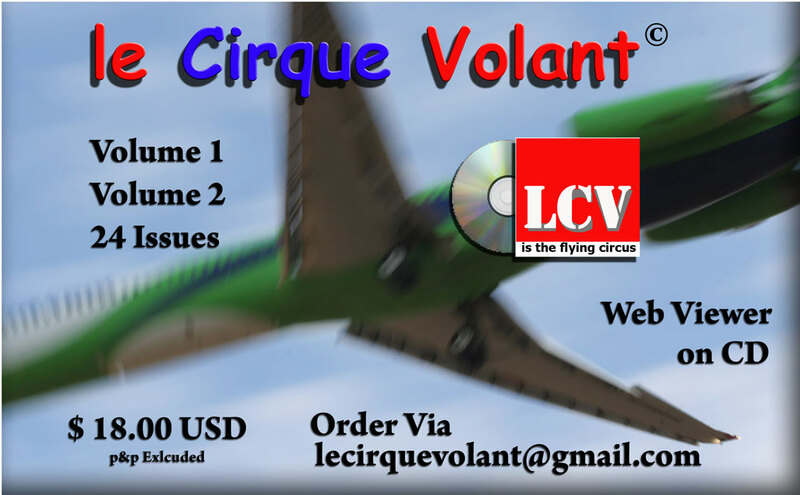 Available now : “The Best of Le Cirque Volant“. 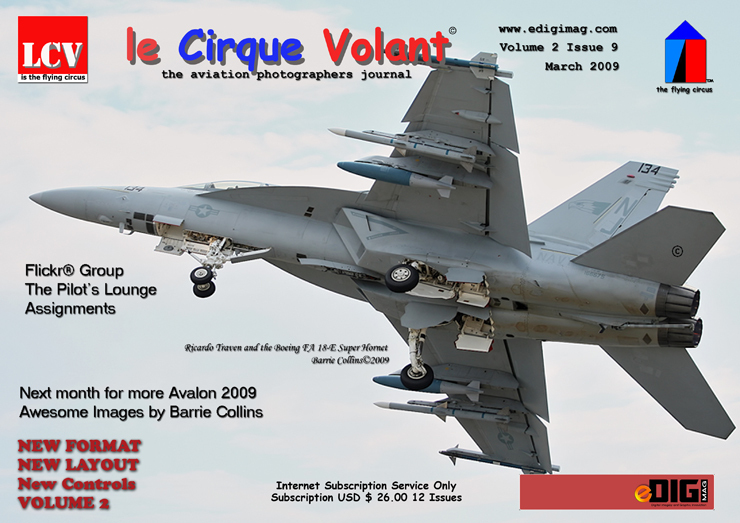 100 pages of the best aviation images from the contributors to the most read aviation photography e-magazine from eDIGImag® USA. Plus all the 24 issues presented as a web viewer on CD. Just the past 24 issues : $ 18.00 p&p excluded. with your requirements and your postal address. This is a limited offer. Enquire for the Special price for South African subscribers. Here’s the Cover – The Winning Entry. Right, Completed and uploaded to the Server. Await your email for the direct link. Oh, comment on the latest production. Completed. Here’s the Cover. New Subscriptions and Renewals open .. Special Deal. International USD $ 20.00. The January 2009 Issue is published. The cover. Subscribers — Production is completed. 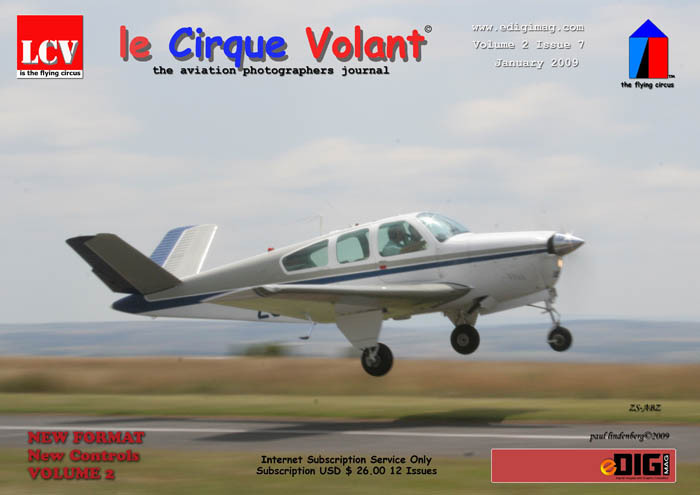 The December Issue of Le Cirque Volant uploaded and ready for subscribers download. Casual viewers will see an abridged version of this Issue. Subscribers of course get the full issue. NOTAM : December 2008 has been Uploaded. See the “Donations for the Herman Potgieter Project …” page in this blog. 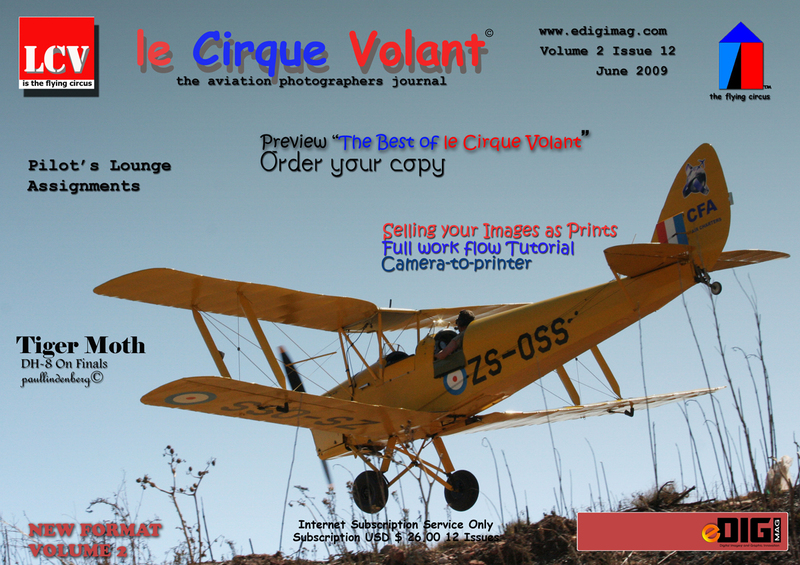 After all the interest from the article on Herman Potgieter – A dedication which appeared in the November Issue of le Cirque Volant, I have thought about a real Special Edition dedicated purely to Herman Potgieter and his work. Now, if the interest explodes beyond my expectations, I will design a Limited Edition PDF publication on this subject. I have negotiated with my printing partners a package for an actual hard-copy print, (limited print run), in A3 format, double sided impression. We could have an agreement on this – it’s frightfully expensive – but it would be printed digitally (as opposed to litho printed), stitch-bound and a unique hard cover enclosure. Planned within would be images from Herman’s works, stories and articles plus an opportunity to actually own a mountable print of selected photographs. Ok, here’s the deal – Firstly, if you want to own a limited edition PDF of the proposed “Herman Potgieter Special Edition” please contact me directly, and Secondly, we (my publishers and I) have figured out that a break point to have a printed version of the publication printed, bound and covered, is viable at 500 copies. This publication as I said would be digitally printed on super glossy silk paper (probably 190Gram) in A3 format, so it’s quite ‘large’. I you want a copy, contact me directly as well. The pre-production costs are not so bad, mainly time and trouble related. The rendition to printable output does require major resouces – my layout person, my picture editor and my copy editor. I will do the actual rendition as a file for 1) the PDF publication, and 2) the printed version (Hi-definition, 3400 DPI) for the printers. If you want to come on board with this production, help would be appreciated in the form of donations – it is an expensive excercise. I have coupled the revenue from new subscribers for the funding of the brass plaque (dedication) so I would appeal for funds for the ‘book’. Again, contact me directly. If you have Images and can remember interaction with Herman, put it down in an email and send it to us. You can book ahead (excuse the pun) by pre-ordering and paying for the PDF version, or the printed version. If you pre-order the printed version, you get the PDF version for your archives for free, and, once we have worked out the final cost of each (limited edition) print (the price of which I will post here) I will contact you directly if you have emailed me showing interest. 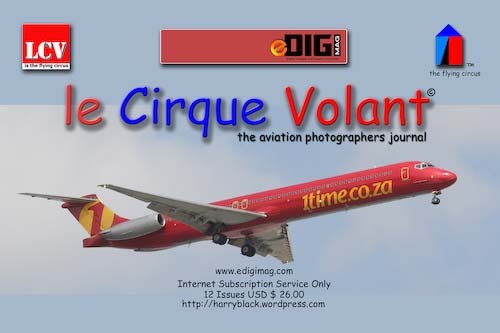 Volume 2 Issue 5 November 2008 publication of le Cirque Volant is dedicated to the memory of the late Herman Potgieter, aviation photographer extrordinaire. For those who consider themselves as photographers in the aviation field can only be inspired to greater heights by the art of this humble man. Herman died in an aircraft accident in Kenya on 13th February, 1998, aged 53. Herman is an honourary member of “The Flying Circus“, having joined le Cirque Volant in 1989. The editor of le Cirque Volant had worked with Herman a number of times, assisting him with specialised mounted camera work. 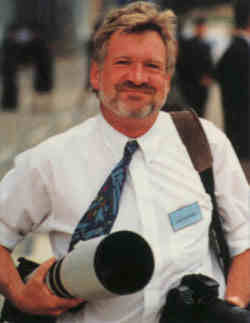 Herman had produced a number of Aviation and Wild Life (photographic) books and was engaged in photography and article production for aviation publications, magazines and year books. His most famous photographs caught the public’s attention with his long standing relationship with the South Africa Air Force and his amazing air-to-air work. His books (no longer in print) are sought after amongst the aviation and modern historical sectors to this day. (If you find a Herman Potgieter book lying around, buy it). 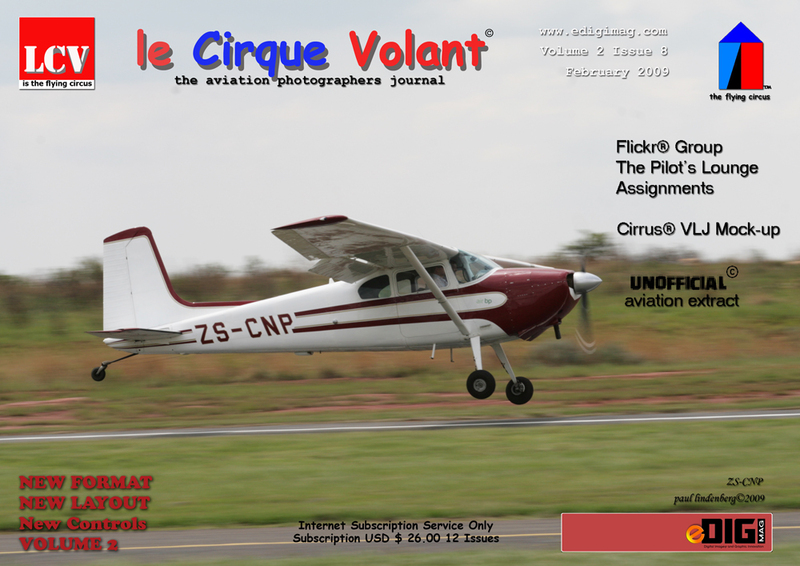 To commemorate the work of Herman Potgieter, le Cirque Volant is designing a brass plaque to be erected in the Air Force Museum (SAAF) located at Swartkop AFB (FASK) and, to fund this memorial, a percentage of all new subscriptions will be put toward this task. There is a target of 600 new subscribers earmarked, so be the first and receive the usual 12 issues at the normal subscription of ZAR 100.00 for South African subscribers, and USD $ 26.00 for International subscribers. e-Mail lecirquevolant@gmail.com for this special subscription offering. 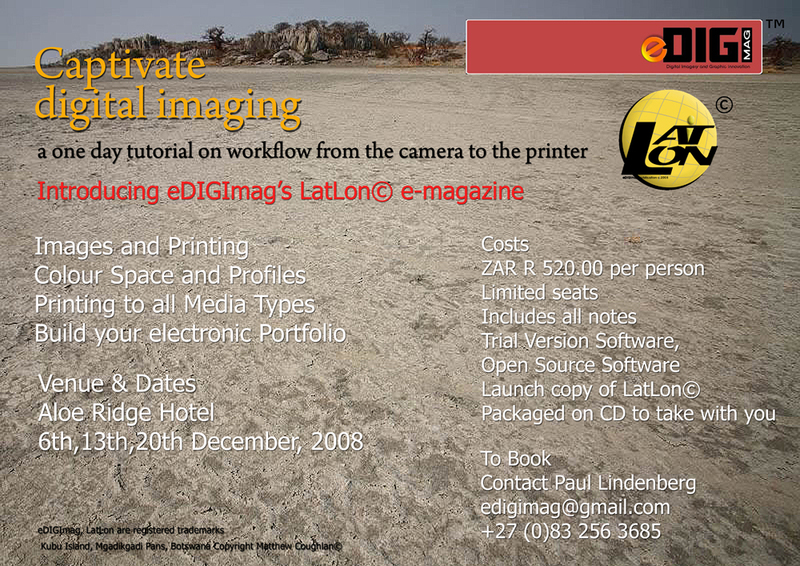 eDIGImag® is launching their new e-magazine LatLon© very shortly, and to find new talent to act as contributors, a work shop is planned in South Africa to empower photographers at all levels in the art of photography. From the Camera to the Printer. 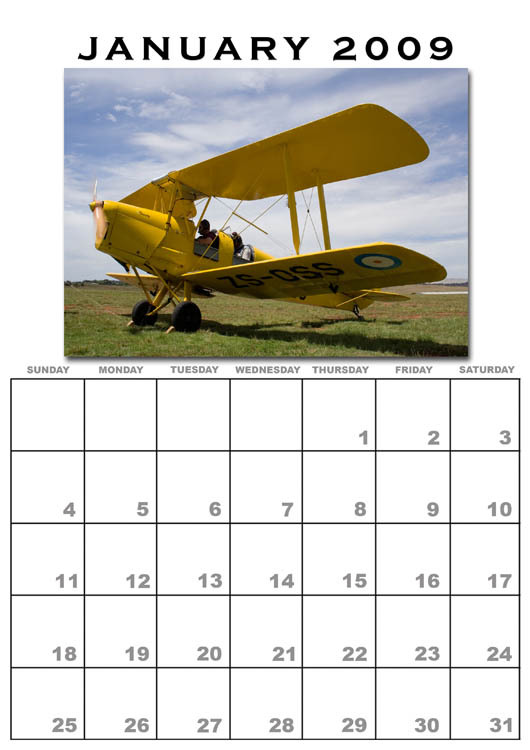 Your aircraft images presented in a calendar format. Also see GPL PhotoGraphics for more stuff. 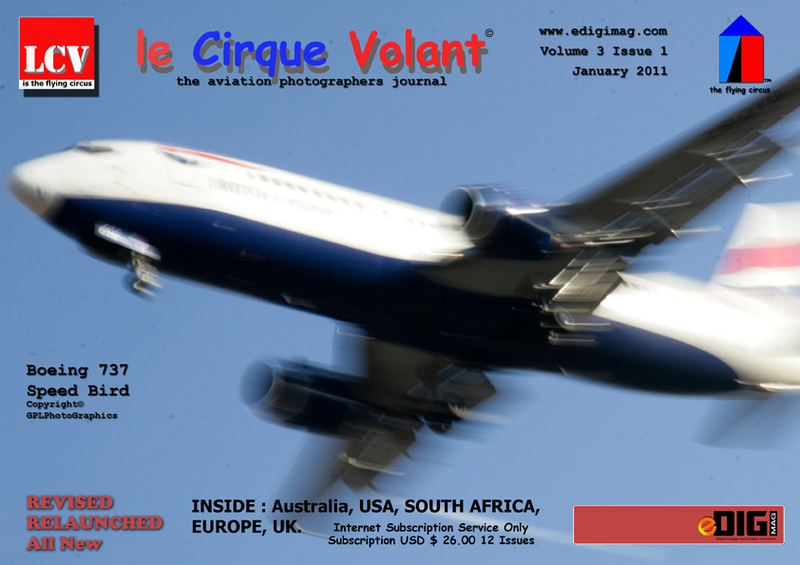 Recently launched : Subscription Service to le Cirque Volant. The First year’s Volume 1 Issues (12 of) were actually free, but supported by the ‘1000 Fans’ group which are people from all over the world who thought the LCV publication good enough to warrant their attention. 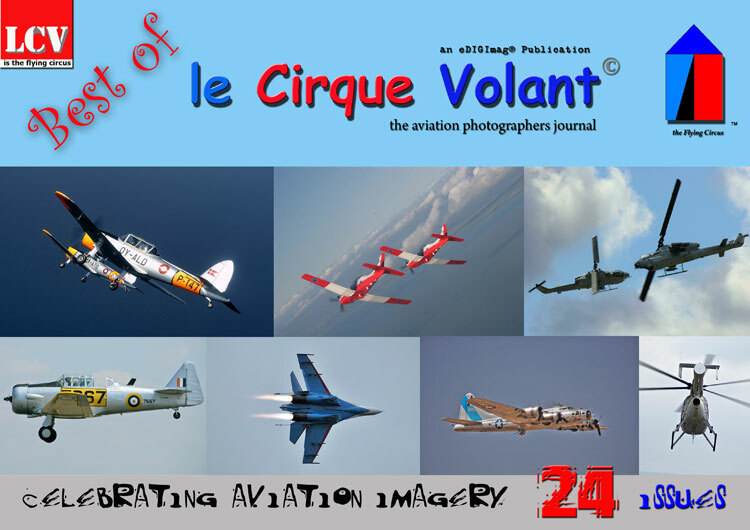 le Cirque Volant, the aviation photographers journal, has contributors in the professional and amateur categories, as well as casual contributors. Images off two popular websites, Flickr® and the recently launched Red Bubble® art site, proved to be the main source. However, LCV managed to convince professional photographers (of the aviation kind) to kick in an article or two, plus some aviation photography tutorials which have proved popular. A whole lot of research is carried out on the internet trolling for exceptional articles, photographers and web-sites all about the subjects of photography and related news. 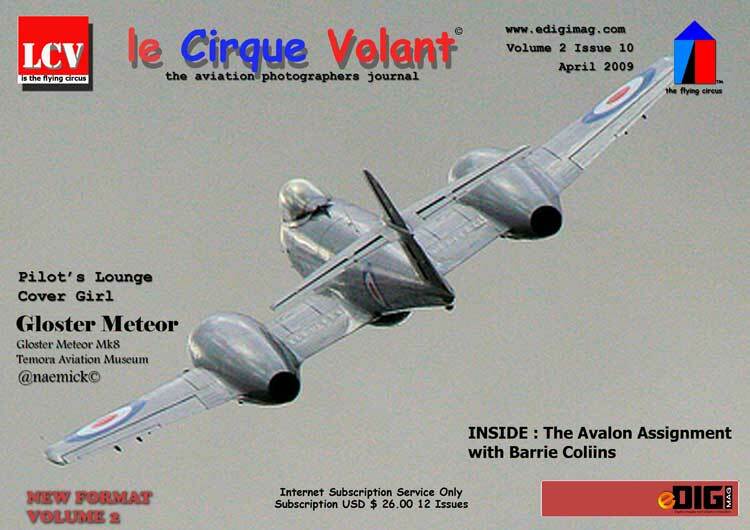 We have also looked into some obscure sites which could contribute (and have contributed) to LCV, and looked into the past for stories that caught the imagination of aviators and photographers. Our main stream of contributors, such as Tailspin “T” (Tom Harnish, and a real A6 aviator) and Andrew Schofield are at the top of their game; we are proud to be associated with them. There could be other sources of amateur (and semi-professional) contributors, but we are still searching for them. Some .co.za sites are a little apathetic when it comes to actively contributing, but have exceptional images available none the less. 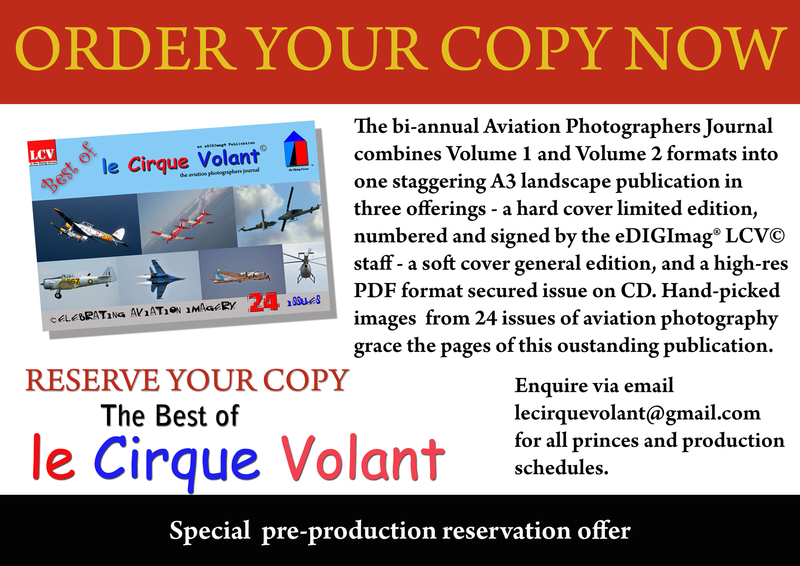 The le Cirque Volant e-magazine publication from eDIGImag® is widely recognised as a definitive genre dedicated to aviation photography (we’re just waiting for an odd award or two to confirm the fact. Our readers range from Airline Captains to Military Pilots, from corporate jet drivers to civilian owners/pilots and from professional aviation photographers to amateurs. Subscriptions, to aid the continuing publication development, are open, worldwide. Since the LCV e-magazine started locally, in South Africa, the annual subscription is a basic ZAR R 96.00, while in Australia it is AUD $ 26.00, the USA USD $ 26.00 and Europe € 26.00, and the UK ₤ 12.00. So, to subscribe, leave a comment or email (lecirquevolant@gmail.com) so we can make comms with you for bank co-ordinates. We are also offering up a gift or two to sweeten the deal : for the local readers, an A4 image off the EDITORS stock-library for free (valued at R 55.00) and for the international readers, a 1Gb memory card or a Flash Card. Try it out, you might get lucky. AND, if you want to catch up with all the issues, a CD is available loaded with all Volume 1 Issues PLUS the latest issues of Volume 2 for USD $ 20.00 (local SA readers can get this for R 114.00), post & packaging included. Order soon. Just to mention, subscribers get the de-luxe version of the e-magazine, encrypted with an indivudual password which allows full-color printing, directly. each subscriber gets a standard, spam-free email with a direct link to this site (or, in the future, to our new secure download site) and their individual password. Otherwise, only an abridged sample of each issue is available for download to the casual reader. 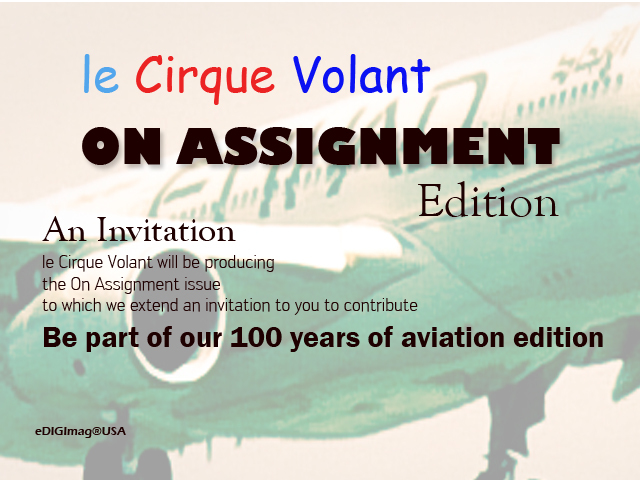 So, join the ‘1000 Fans’ of le Cirque Volant and keep the interest high. And get in Close. Is the business of Photography your consideration?